In this series of articles, the Educational Technology team will be providing an insight into existing practice using technology for learning and teaching at Falmouth University and also at projects being undertaken within the wider HE sector. Our previous articles have looked at the process of Feedback, Open Education, Assessment and Digital Literacy. The term ‘Blended Learning’ is interpreted in various ways depending on the practitioner that you are talking to. A good definition is that it is learning that takes advantage of the best of both physical and digital learning environments. As a result, open-ended activities take place which engage the learner and enables them to control their own learning in a directed setting, alongside face-to-face interaction with their tutors and peers, and structured activities which are focused and purposeful (Schmidt, 2007). There are a lot of pedagogic and instructional models and theories of learning that are adapted to describe teaching and learning processes and facilitate ‘blended learning’. Applying these into the process of designing learning in both digital and physical environments results in excellent learning experiences for your students. It isn’t always as simple as that though. There are many modes of learning when you consider mobile, social and personal, synchronous and asynchronous, online, face-to-face etc. Sometimes the student’s learning preference doesn’t co-exist harmoniously with the style of teaching; so formalising, or structuring the delivery of teaching and combining it with a flexible approach to learning gives the student the flexibility to learn in a way that is effective for them; but be guided by purposeful and meaningful learning activities. If your course/module is due for a re-design, or yet to be designed, then we would recommend that you talk to us about good practice that is already proved to be highly effective in the field. 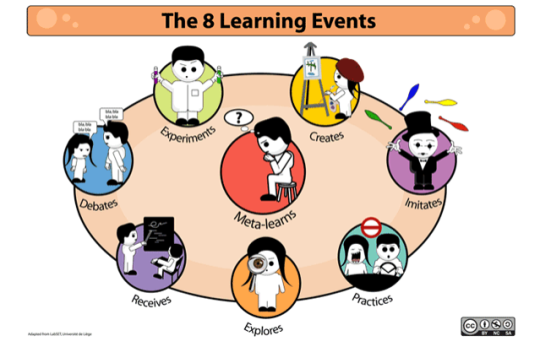 The Hybrid Learning Model developed by the University of Ulster combines events that take place during the learning cycle and suggests a clear approach to applying each event into practice. The model brings together 8 learning events model developed by LabSET, University of Liège (Verpoorten et al, 2006), and Sue Bennett from the University of Wollongong’s 30 verbs, to focus the mind on the human element of learning and teaching and the interactions between participants in the learning process. The CAIeRO process, used as an essential part of validation and periodic subject review at the University of Northampton, takes teaching teams through a set of six stages (listed below). The workshops are participant-centred, and are facilitated by Learning and Teaching experts. Blueprint: for the course or module – a revised and agreed spec. Storyboard: The storyboard incorporates any face-to-face and online components (synchronous and asynchronous), aligned to the learning outcomes and assessment. Prototyping: We design specific elements of the storyboard. Not content, but what learners are expected to do with it (activities and assessments). Reality checking: Students are invited to review the team’s work and feed back any changes. Review and adjust: We take those suggestions on board and modify things accordingly. Action Plan: Participants commit to specific actions by certain dates, which will be reviewed at the follow-up session. Take a look through participants’ reflections on the CAIeRO process at Northampton on their LearnTech team blog. Embedding the Hybrid Learning Model into CAIeRO (mashed up with other teaching and learning models throughout the six stages) is a great way to make sure that those excellent learning experiences I mentioned above are created, and that they are delivered in a blended environment. So, essentially, Blended Learning is mixing two or more modes of learning together – like face-to-face sessions and an online lecture – and designing an activity that will help the student to take part in them, create meaningful pieces of learning that they can digest, and can reflect on to consolidate it all. The CAIeRO model’s early days actually started as the Carpe Diem model from University of Leicester (now called the 7Cs of Learning Design Workshop). CAIeRO has been adapted over a number of years, and successfully used in a variety of disciplines ranging from hands on sciences, health and education to fine art and performing arts (plus many more!). During the research for this post, I discovered that the original Carpe Diem model was used at Falmouth with MA Professional Writing back in 2008 as part of the original CHEETAH project with Leicester and 5 other UK HEIs. The Educational Technology team are here to help you with the design stage of course development, as well as implementing it into the Learning Space, or the most appropriate technology to facilitate it. Get in touch to have a chat about setting up a session for your course or module. Schmidt, J.T. (2007), Preparing Students for Success in Blended Learning Environments: Future Oriented Motivation and Self-Regulation. Ph.D, LMU München: Faculty of Psychology and Educational Sciences. Available at: <https://edoc.ub.uni-muenchen.de/6561> [Accessed 16/10/2015].